Denmark's Queen Margrethe has no plans to retire as she celebrates her 70th birthday with other European royals in festivities overshadowed by the travel chaos sparked by Iceland's volcanic eruption. The guest list was truncated Friday as several dignitaries failed to make it to Copenhagen, including Spain's King Juan Carlos and Queen Sofia and Iceland's President Olafur R. Grimsson. "There are great uncertainties whether several other foreign guests will be able to make it," Danish royal court spokeswoman Lene Balleby said. Those in doubt included Britain's Prince Philip, Belgium's Crown Prince Philippe and his wife Princess Mathilde, as well as Crown Prince Pavlos and Prince Nikolaos - the London-based sons of the deposed monarch of Greece. The monarchs of neighboring Sweden and Norway missed the first part of the program on Thursday. The Swedish royal family was in Copenhagen on Friday, and Norwegian King Harald was expected to arrive in the Danish capital later in the afternoon. Some Danes believe Margrethe deserves to retire after 38 years as Denmark's head of state and hand over her duties to her oldest son, Crown Prince Frederik. That's what Queen Juliana of the Netherlands did in 1980, when she turned 71, and abdicated to her daughter, Queen Beatrix. 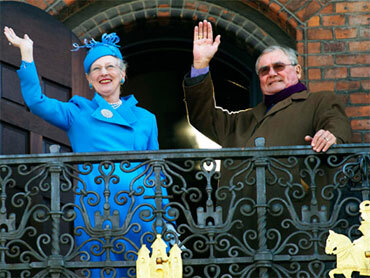 But Margrethe says she still feels committed to her royal duties. "I'll continue as long as I have the power to do it. I am not winding down. There are still many things that there are important to do," she told reporters ahead the birthday celebrations. Tens of thousands of people gathered at Copenhagen's Amalienborg Palace square to cheer the monarch. Margrethe and the royal family stepped out on the balcony as cannons at a nearby naval base fired 27 rounds to salute her birthday, in keeping with royal traditions. Margrethe then rode in an open carriage from 1864, escorted by mounted Hussars, to Copenhagen's city hall where she joined Dutch Queen Beatrix, Crown Prince Willem Alexander and his wife Princess Maxima, and King Carl XVI Gustaf and Queen Silvia of Sweden for concerts with children, followed by a banquet lunch. The queen's powers are largely ceremonial, including receiving visiting foreign dignitaries. Besides her royal duties, Margrethe has won praise for her artistic works, which range from abstract paintings and embroidery of church vestments to making altar pieces, dinnerware and scenery and costumes for television and theater plays. Though there is a small group of opponents who want Denmark to become a republic, opinion polls regularly show about 80 percent support favor maintaining the monarchy.